Hi everyone, Darcy here to spend New Year's Eve with you. I hope you have all had a wonderful Christmas week with families and friends. 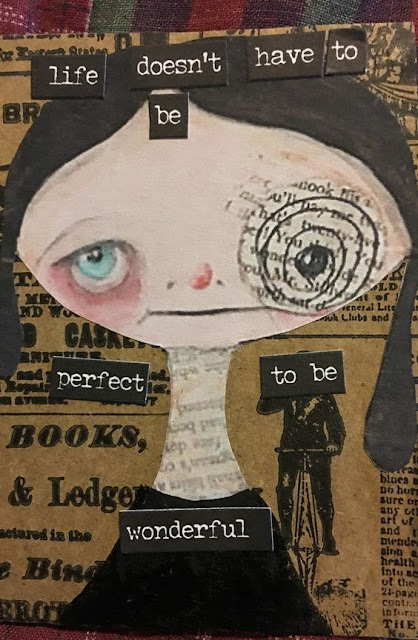 Of course we have also had round up week, looking back over some of the incredible blog post inspiration from the past year. 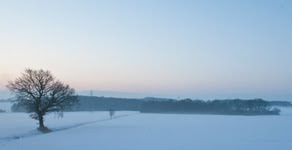 It has been lovely and relaxing to curl up with a blog post and a chocolate or two. I have recently been converted to gin and may have had several plum and vanilla mixes, they were especially lovely. So onto our first challenge of the year. As usual we change things up slightly each year, and so to kick off the year we will have a month long challenge. 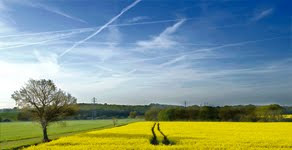 We are going to be sharing so much inspiration with you and so many new products that we need a month to fir it all in. 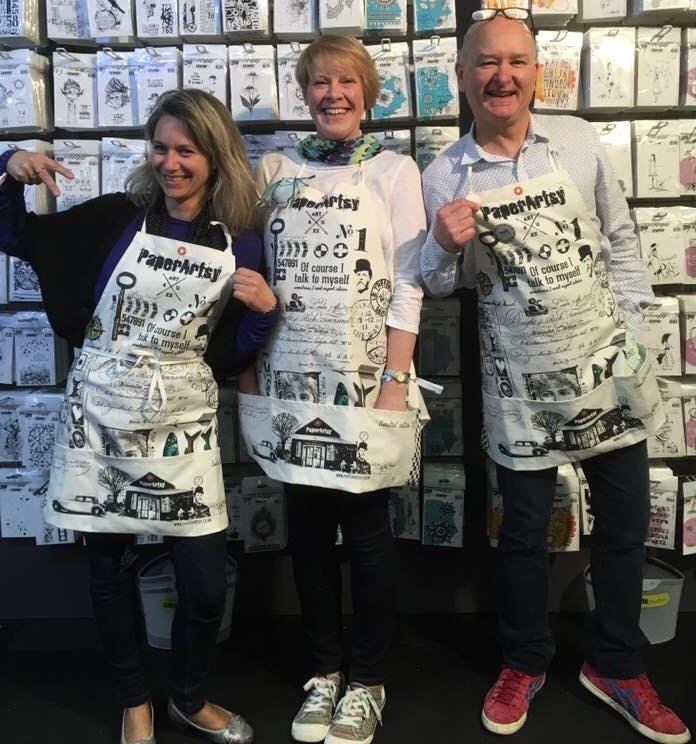 We have also changed the prize for now, and will be giving away the much sought after PaperArtsy aprons to challenge winners. ATC's, I am sure you have all heard of them if not made some, but for those new to these mini pieces of art here is a little background information. 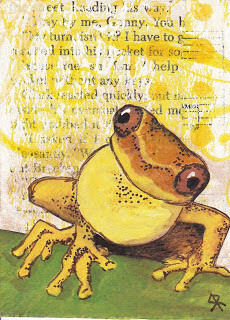 ATC stands for Artist Trading Card, these have been around since the late 1990's, so they are a relatively young form of art. 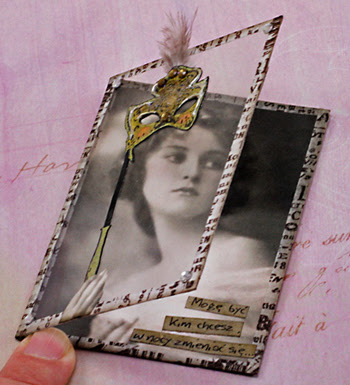 Though other forms of collectable cards have been around for over 120 yrs. A Swiss artist, M.Vänçi Stirnemann, was having a huge exhibition of his artworks which were all tiny pieces, the same size as baseball cards. At the end of the exhibition people were encouraged to swap their own art for one in the exhibition, this developed into a trading project. Anyone, from any walk of life, or skill level could take part. 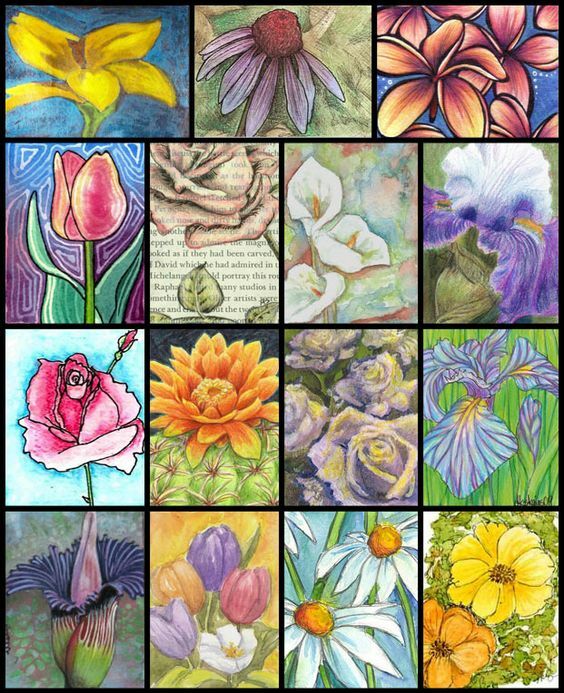 The most important part of the ATC project was that the cards were traded and not sold. Within a few weeks of this Swiss project ending other artists had set up more trading sessions in Canada, and from there it became a phenomenon that spread around the world. There are dedicated websites with galleries and forums just for chatting about ATCs. The flower cards below were all on the Illustrated ATCs website. Some people confuse ATCs with ACEOs, the latter stands for Art Cards, Editions and Originals, these cards can be sold, and that is the major difference between the two. One can be sold and the other should be freely traded. 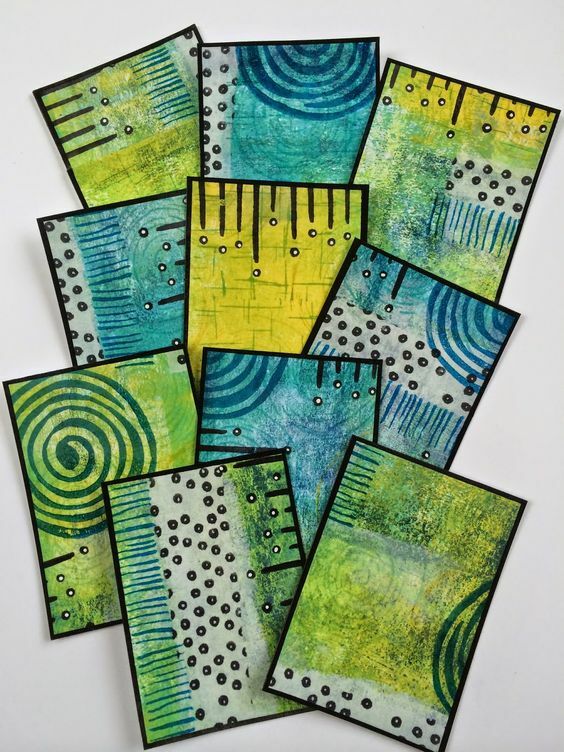 Besides being given away, there is a standard size for ATCS, that is 3.5 inches by 2.5 inches (64mm by 89mm). This is smaller than most playing card decks. 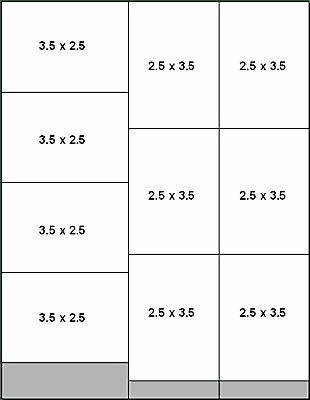 Here is a great template that shows an easy way to get the maximum number of ATCs from one sheet of A4 card wwith very little wastage. 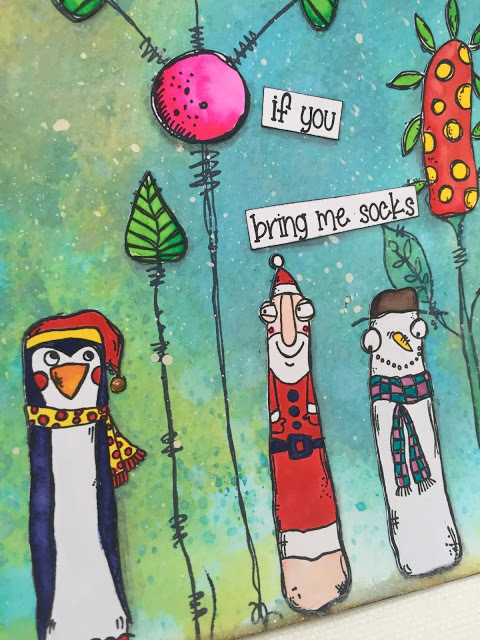 ATC's can be any theme, any colour, any medium, literally anything goes, however they tend to be fairly flat as they are often mailed out. It is also easier to store them if they are not too chunky. 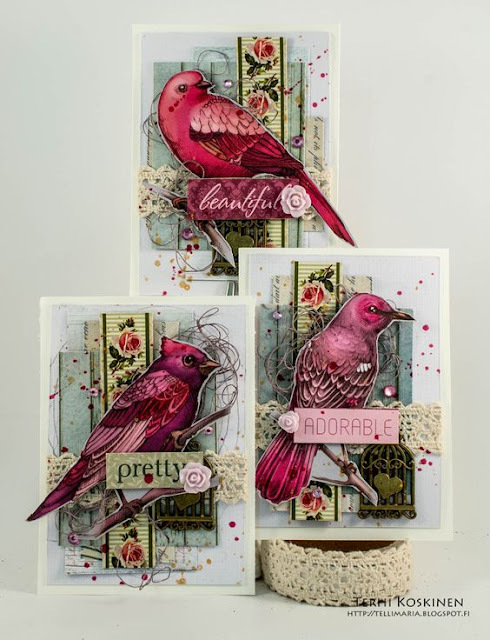 The following two cards both have embellishments but you can see they do not add too much bulk. 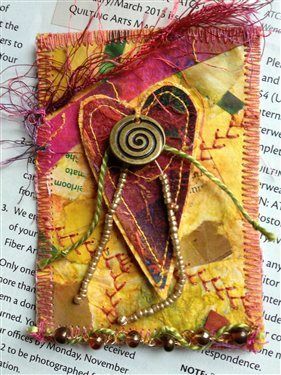 An ATC does not need to be paper or card, it can be fabric, just adhere to the size guidelines. 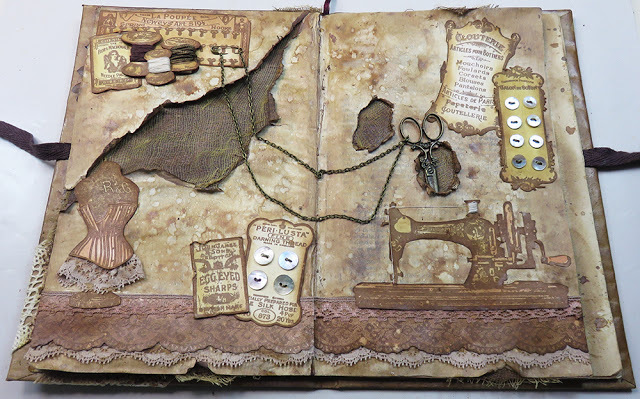 This one has such fabulous textures and layers, fabric, stamping, embossing, old paper, what is not to love. Anything goes, what will be your chosen theme? 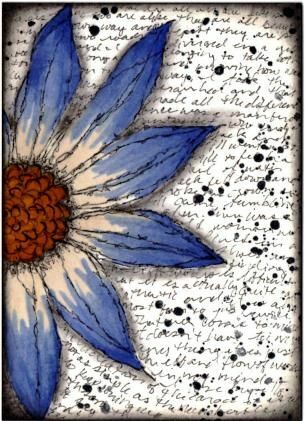 I especially love the simplicity of this doodled flower with text. These cards have such lovely blended qualities over the torn paper edges. 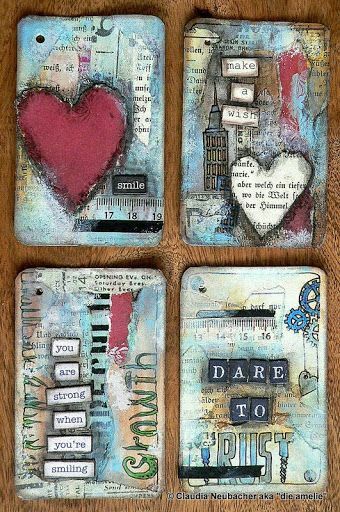 If you like the distressed look then these are for you. 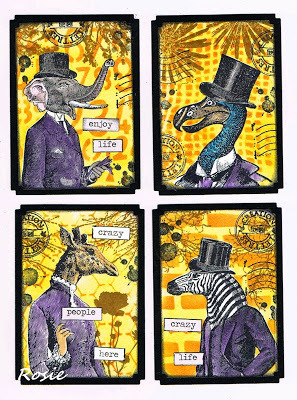 These are done on playing cards, so not strictly ATCs, but there isn't much difference in size. 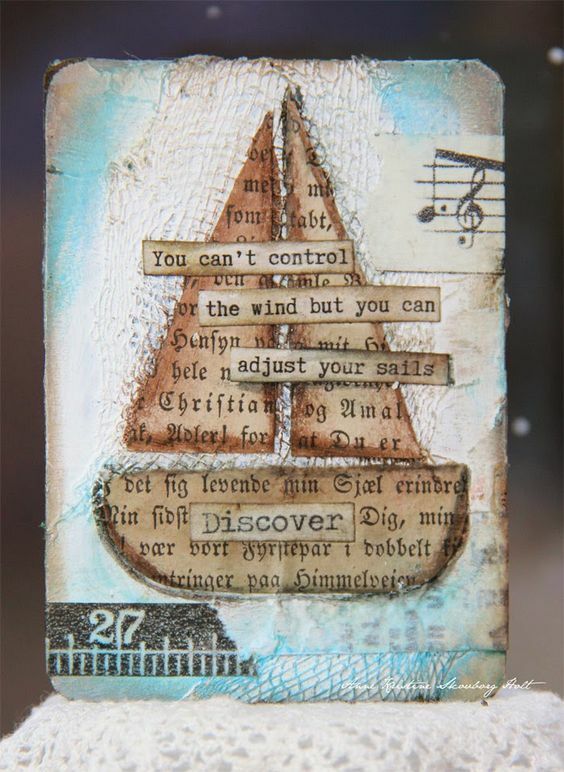 Some people like to round off the corners of their ATC's. 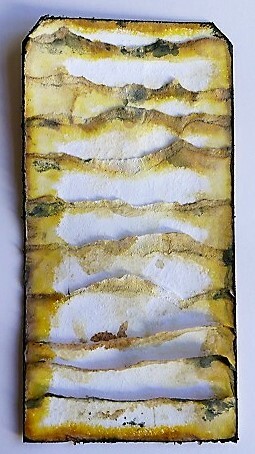 More mixed media, stamping and layering. I love the eye peeking out from the butterfly. 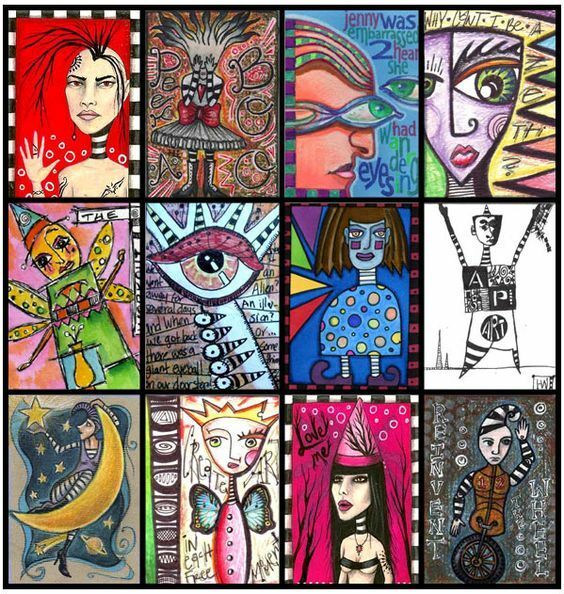 Mostly artists will make a set of cards in one theme, they will keep one from the set and trade the rest. All traded cards should be numbered on the back, and should also have a title and the date and the artists name and contact details on the back. A minimalist set now from our own Ellen Vargo, these could be traded as is or built upon. 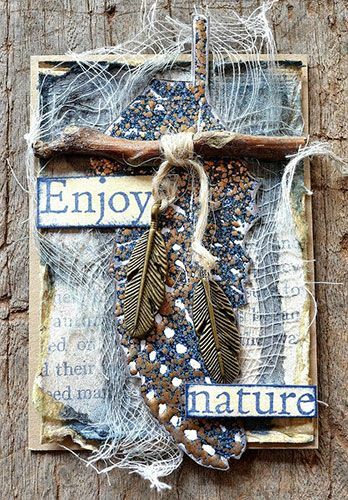 These ones are so yummy, the gorgeous colours that pop, the sniped paper feathers, the painty, corrugated texture in the background and the tiny words and number embellishments. These birds are so bright and pretty, they were fussy cut from scrapbooking paper, the artist had added such interesting layers beneath them. 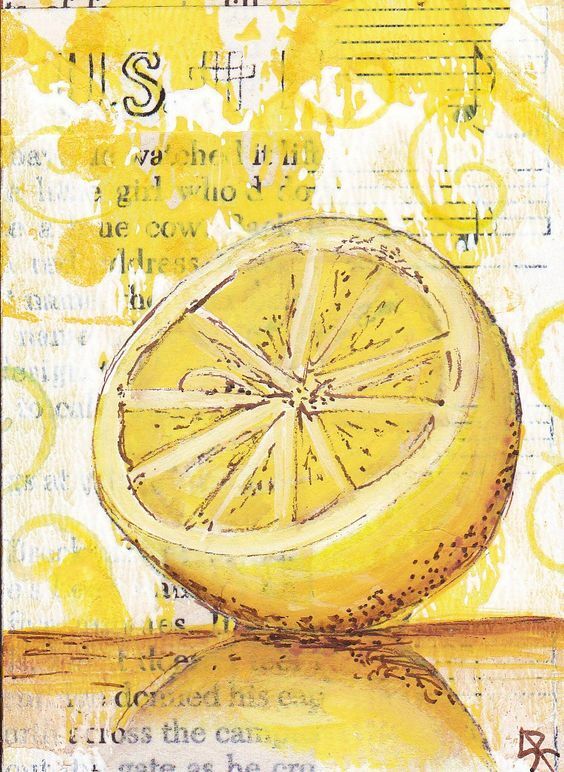 This set comes from a theme that is just 'yellow' , a lemon and a yellow frog are amongst others on her blog. Your theme does not need to be complicated, a simple colour is enough. This one really caught my eye, the image is a simple vintage photo, but how clever is the hinged, acetate door. 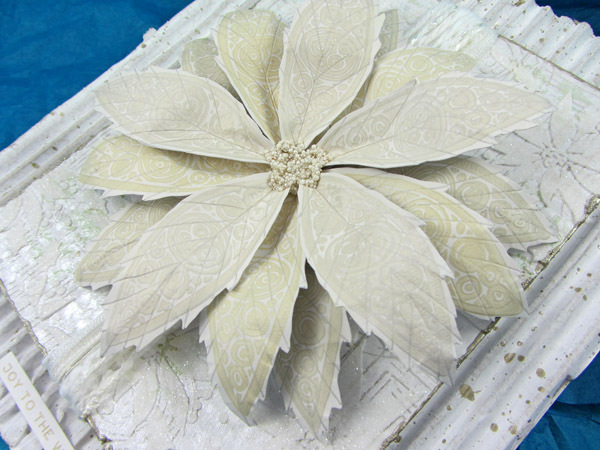 A small paper clay heart adds subtle dimension to this set. 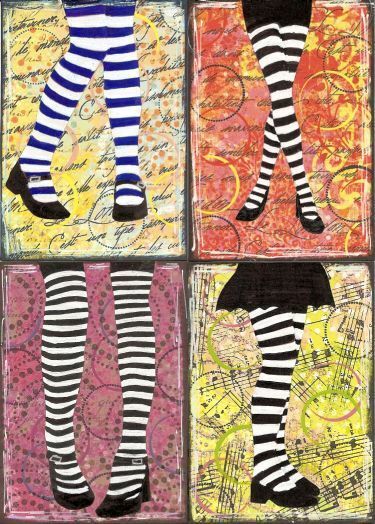 These great zendangles are simple but very effective, it is all about the variations in length and pops of colour. This set looks to have been influenced by zettilogy, what are your influences? do you have a favourite artist or song or book? any of these things could inspire a set. 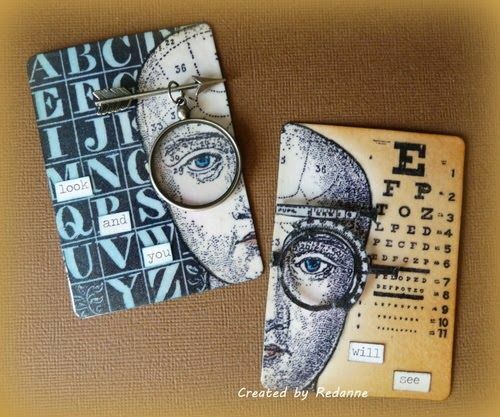 These cards have been done in a Tim Holtz style, these really stood out as the stamping is so crisp and clear. when working on such a small scale it is important to keep stamping as clear as possible, always use the right ink for your surface. There was so much inspiration, but I couldn't pass by these wonderful creations. I love the humour in them. 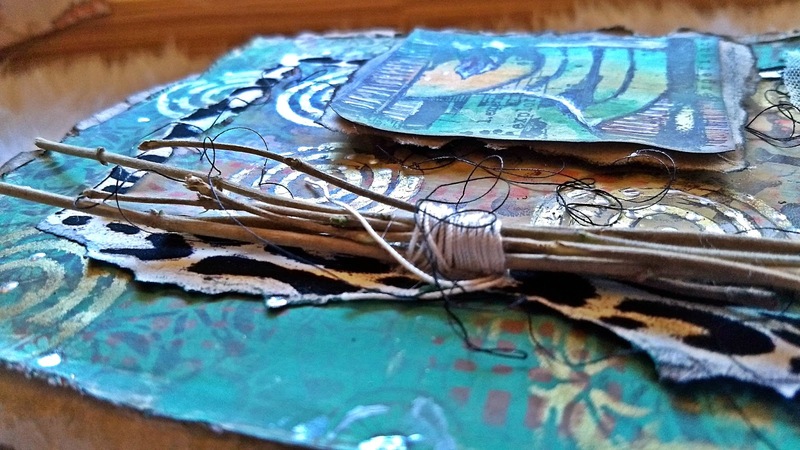 Once you have your ATCS made you need somewhere to store them and to store your swaps, you can buy plastic pockets for trading cards and keep them in a binder, but there are some fab handmade storage ideas out there. 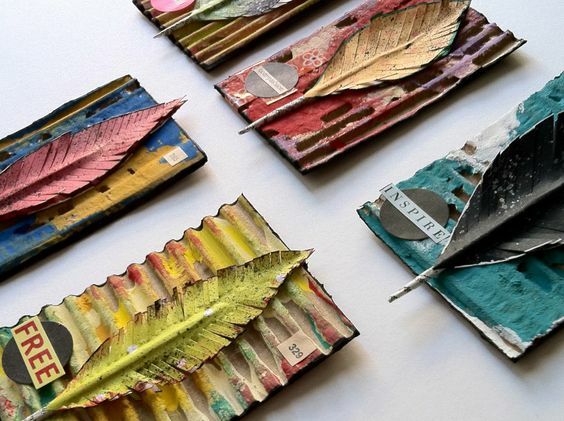 Of course you can just pop them onto a book ring and hang them in your studio rather than hide them away. 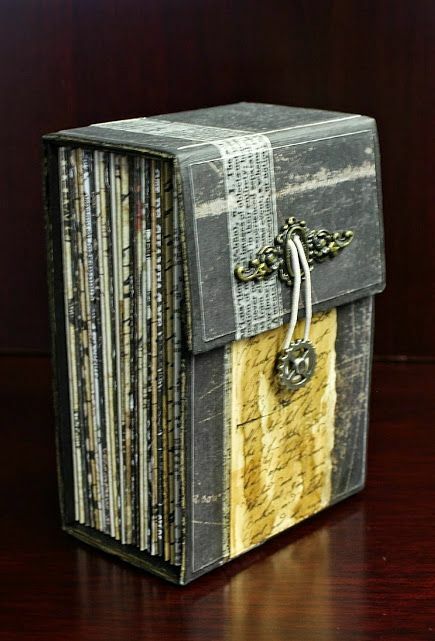 I do really like this box though , it is filled with small envelopes to hold the ATCs, this could be made to match your cards or to match the decor of your room. 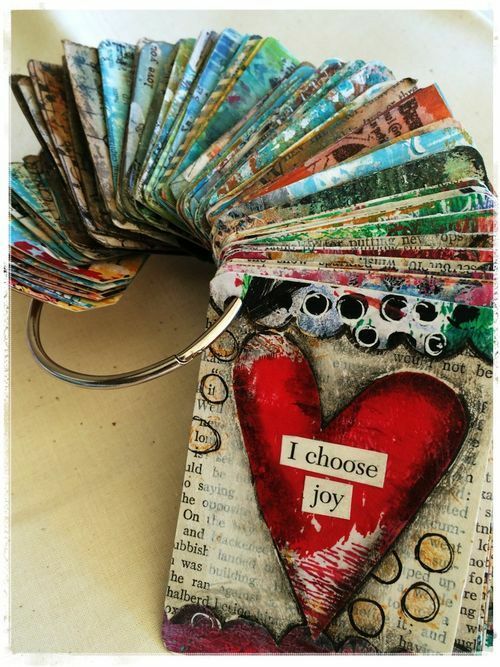 I hope that has inspired you, I pinned so many cards, it was hard to choose. 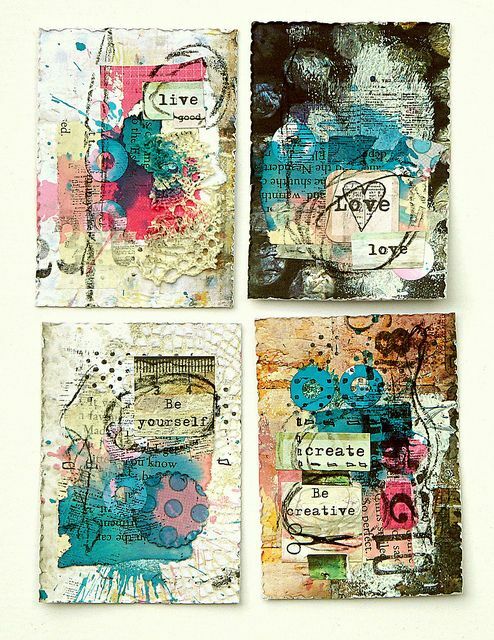 One sheet of A4 card will give you 10 ATC blanks, so pull out a sheet and get cracking. We would love to see what you make, and if you feel inspired why not swap your cards with other people. 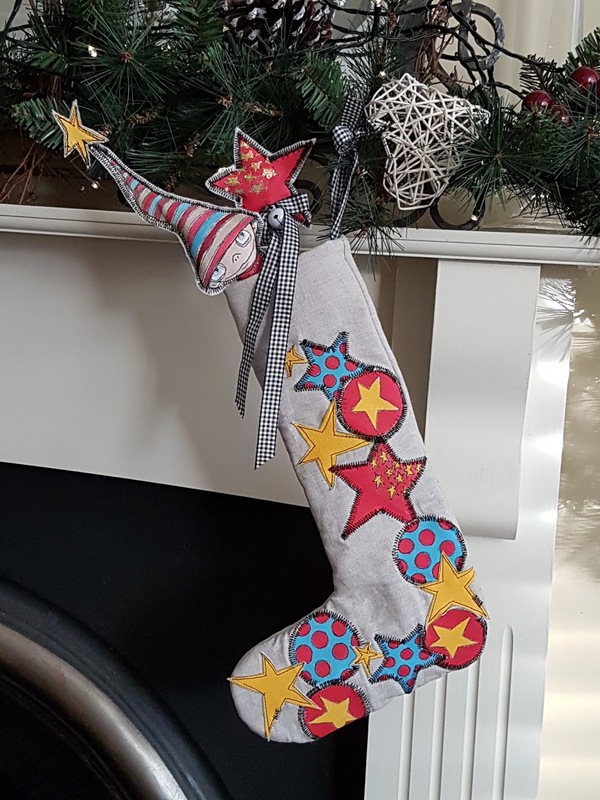 I hope your Christmas break is going well, although many of you will have had a day or 2 back to work, for many people its a relaxing time over the Christmas New year week. 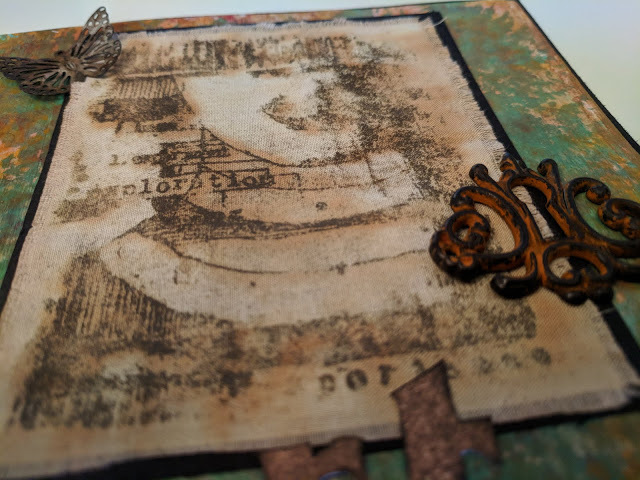 Here is another post looking back and celebrating the inspirational ideas presented on the PaperArtsy blog in 2017. 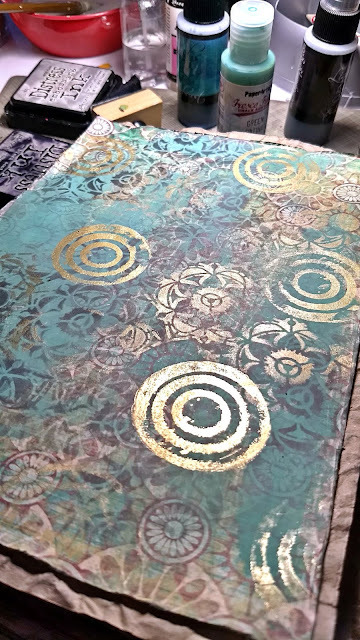 Metallics have been such a strong trend in interior decor for a few years now, and naturally this is also reflected in our crafting. 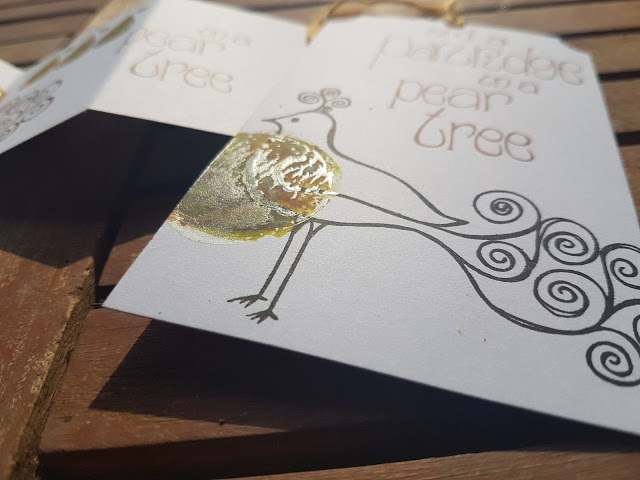 Gold leaf, metallic paints, embossing powders, mica powders and sprays, there are multiple ways that all these elements can successfully add the blingy 'magpie' effect into your work! 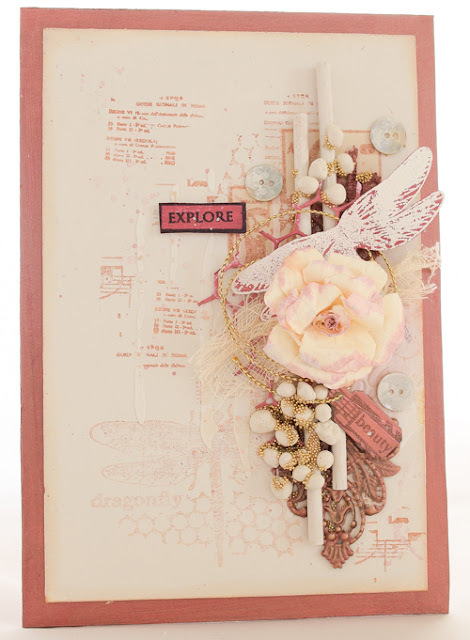 Jennie's trademark soft shades contrast with gold perfectly in this textured assembly of vintage-looking elements. 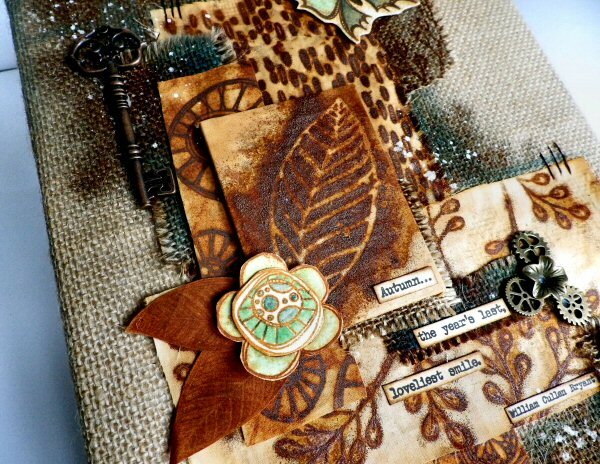 I thought the delicate metallic embossed colour on Alison's post worked perfectly with the shades of brown. Both she and Raquel prefer to stamp in brown, than black, and i must push myself to stamp wit other coloured inks this year! There you go, one New Year's resolution sorted! Well, yes, we chose Glitter as a topic!!. So don't fall over in shock! 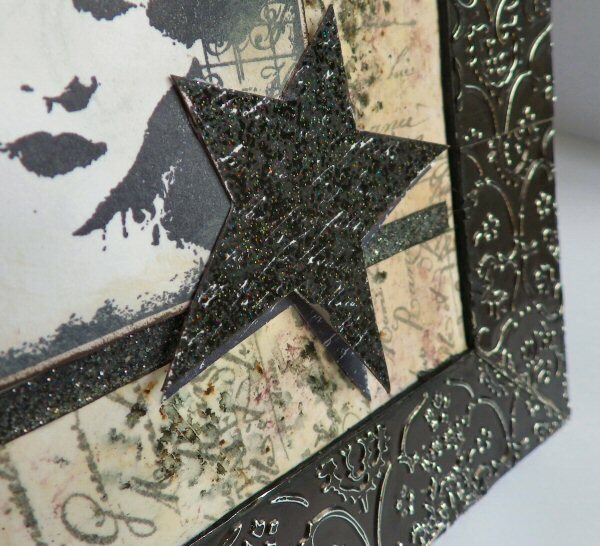 But all these sparkly blingy things fell into the same zone for this round, so glitter it is...take a deep breath! 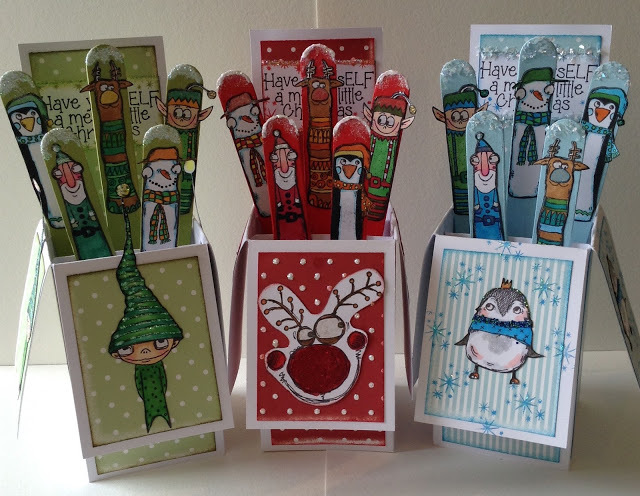 Chris Cresswell made a wonderful array of cards and these popsicle sticks fitted the tall zinski stamps perfectly, look at the cute glittery tops! 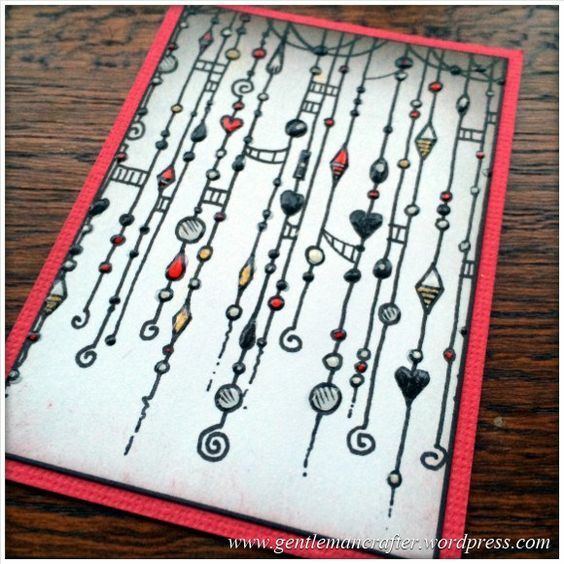 Go and check out her post, so many card ideas here! When Jo Firth-Young happened to drop into HQ, and saw me planning out the topics, she booked herself a glitter spot there and then! She LOVES glitter, and Christmas is always her perfect excuse! 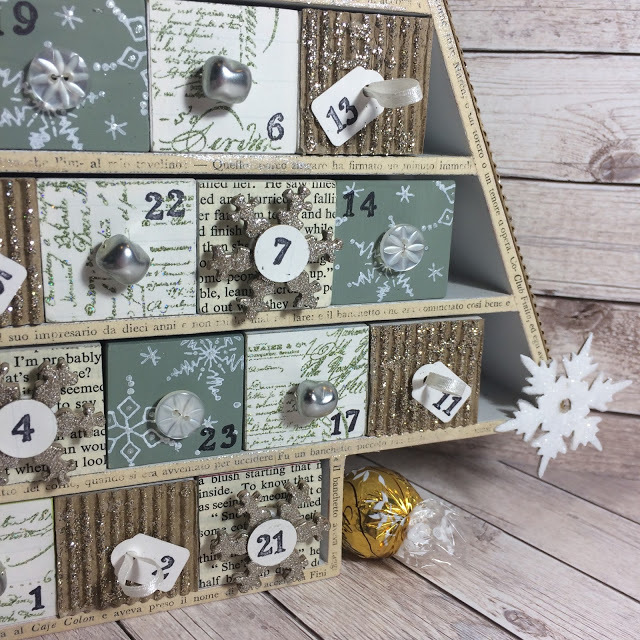 Here she has decorated an advent calendar perfectly! The really funny thing about this topic was that (apart from Jo) almost ALL the bloggers were OUT of their comfort zone with glitter, so many went for the non-traditional glitter option, or used very little of it. This was one of those very subtle takes on the topic from Sue Carrington. Fabulous! 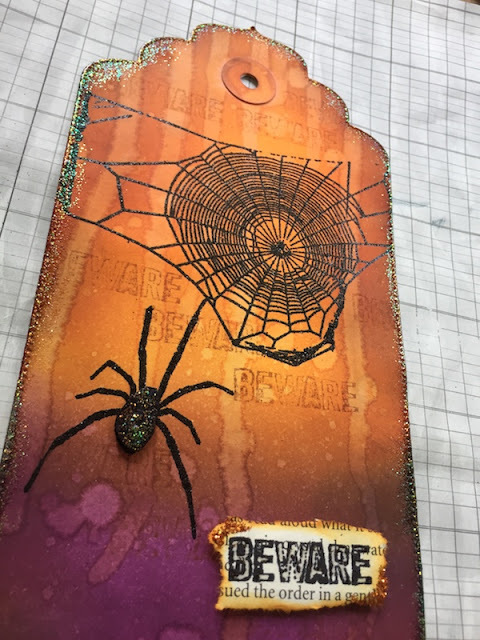 And Corrie added subtle holographic glitter to her Halloween backgrounds! But I was blown away by Raquel's Star decorations. 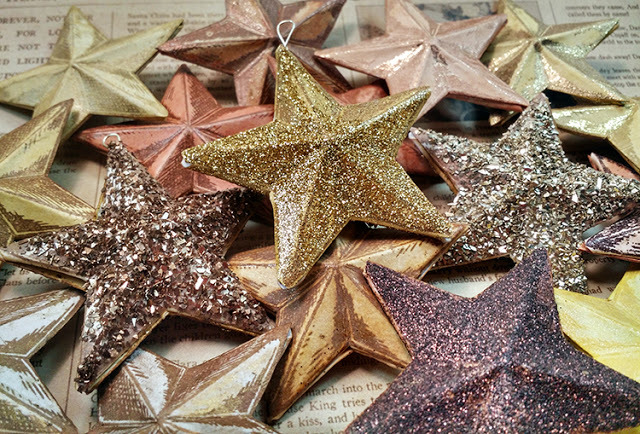 She turned her 'flat' star stamp into a whole bunch of glittered tree decorations! And Keren used alcohol ink pens to colour glitter paste!! Clever clogs that she is! 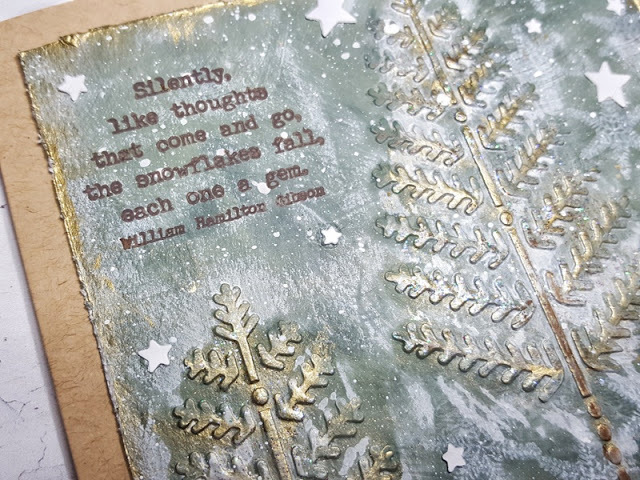 So glitter lead us nicely into the pearly area of mica, pearlescent paints and so on! You can see this really kicked us into a festive vibe in October! Plenty of cards and decorations were being made in readiness for Christmas! I loved this frame by Autumn with the pearly vibe to the eggplant EP, but the panel inside was a gorgeous marbled effect! How elegant! And then stamped on them! How does she think this stuff up?!?? 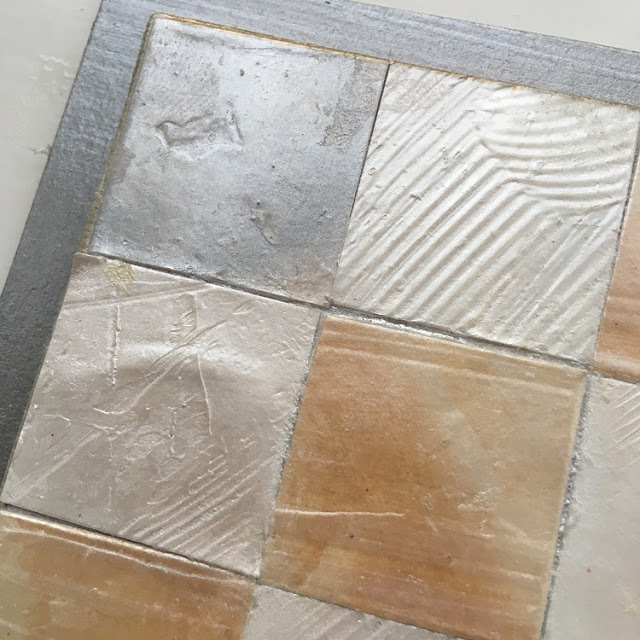 I adored Ruth's soft mosaic tiles! These would make an amazing frame for so many pieces of art! And Bryan created some fast cards with his layering of pearl onto other shades for a quick 'pop' of pearl. Well we couldn't miss out 'rust' in this round of metallic madness! 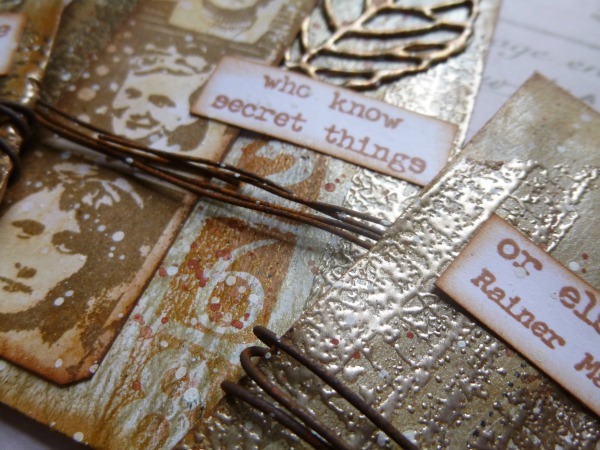 Many people knew about our rusting powder, but never really played with it extensively! The trick is you need to glue it down first with a good gel medium, then spritz, keeping it damp until the colour is at a tone you prefer. My best results are direct onto untreated wood or fabric. 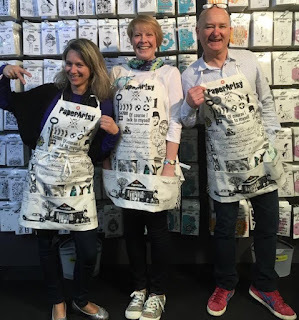 (so no painty base layers) But our bloggers had other ideas to try! 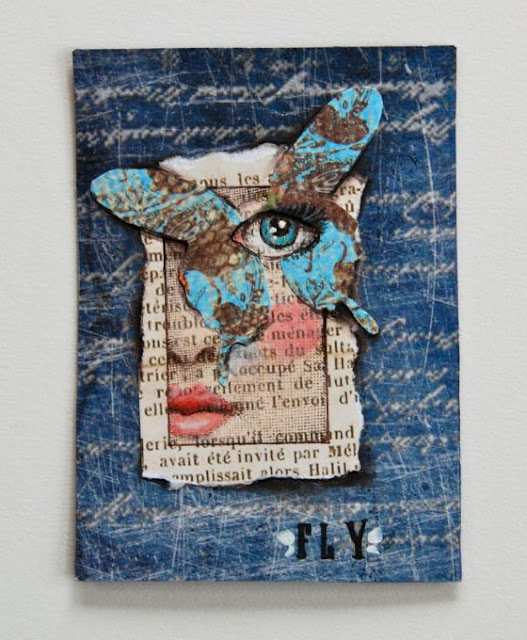 Sue Carrington rusted everything in sight, then created a fabulous homage by the way of this collage. Clare M used layers of paints to create her rusty effect. This is such a striking background! 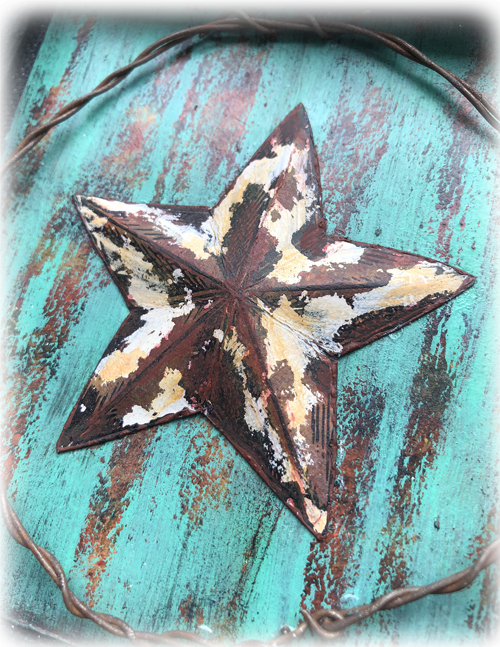 Nikki nailed a patina effect (of course she did!!) as she is well known for her patination skills! 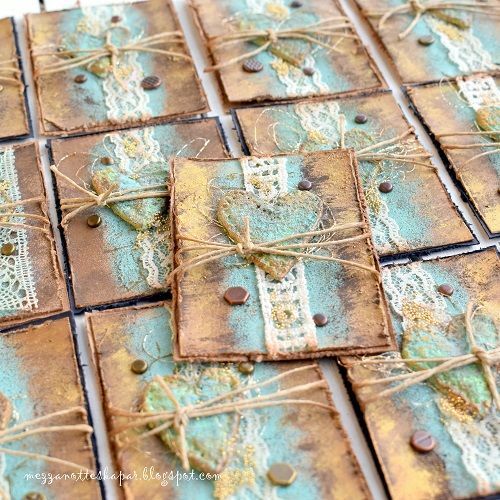 The colours in this are amazing!And she also used that gorgeous star of Raquel's! 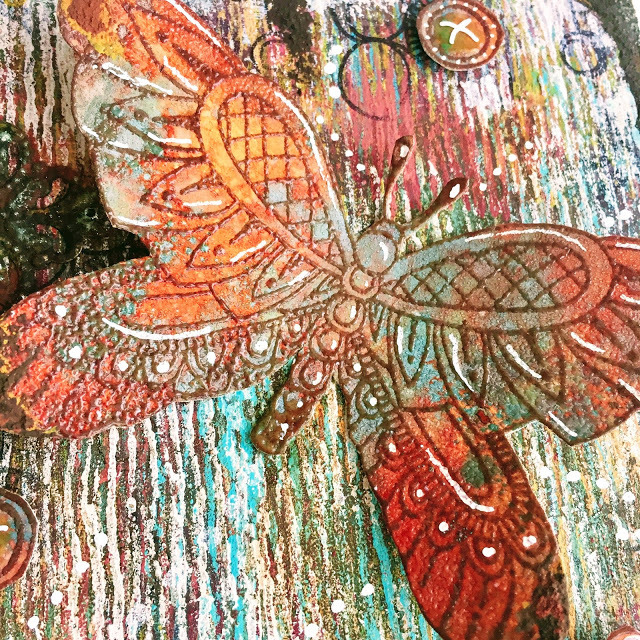 And finally for this topic we saw Miriam rust a stamp image onto fabric! Worked a treat too! 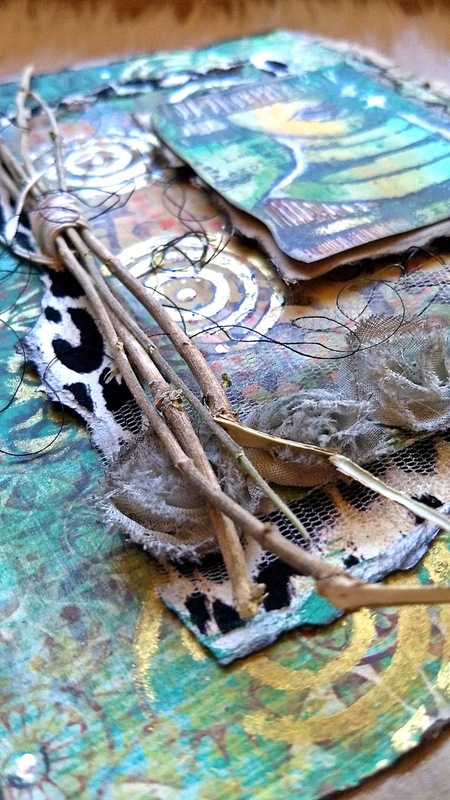 It is awesome to look back on what our bloggers have created. Tomorrow will be our final wrap up of the final 3 topics of 2017. 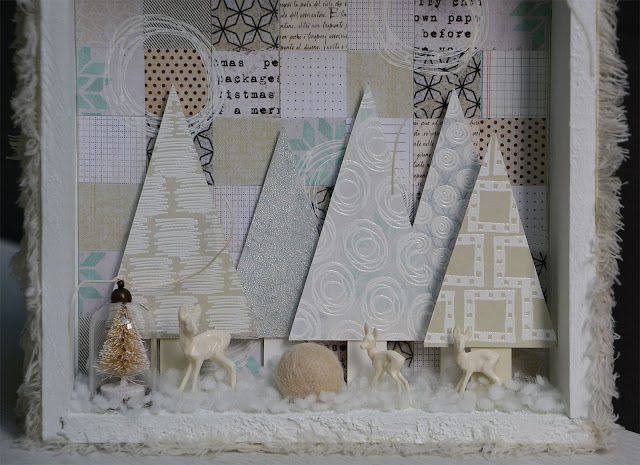 Thanks for being part of our blog, and following along with our designers, and responding to their creativity!